Today we're going to begin meeting the twelve that will ultimately determine my fate. I'm sure they'd prefer to maintain their anonymity, but hey...it's my movie. 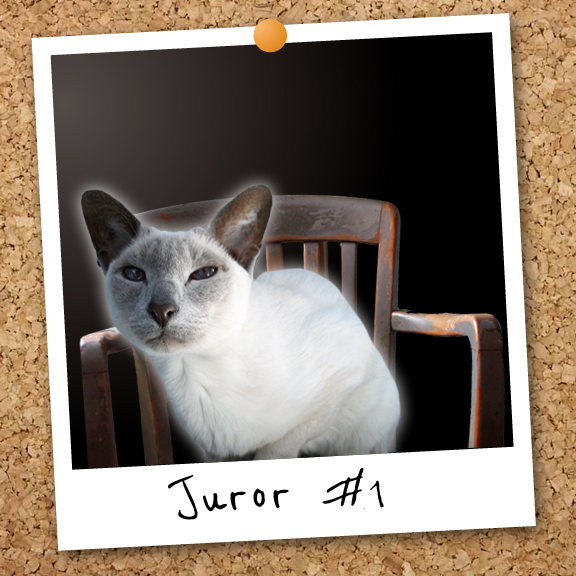 And what better place to start than with Juror #1, the Jury Forecat, a.k.a. Penelope, The Cat From Hell. KATIE: Thanks for joining us today, Miss Nellie. NELLIE: Yous wants to talk to ME!!! Oh, how glorious! KATIE: So Miss Nellie, besides ME, what's your favorite part of the video? NELLIE: My favorite part was the panning across of the jurors (of course) because Me could see ME! But seriously, me liked the part where Katie was dragged off to jail. NELLIE: Kozmo LOVED the whole thing. He still has a secret crush on Katie and the Hairy Slobbery sisters liked that the judge is a doggie and so is one of the jururs! Dinnamon and Bob both thought the doggie would think yous was guilty because, after all, doggies always blames everything on the cats. KATIE: Clearly this is not looking good for me. Ok Nellie, my last question...I'm afraid to ask...Guilty or Innocent? NELLIE: Katie, NOTHING we cats do is jail-worthy. Obviously NOBODY did the crime. (At least that's what me ways at our house and even the hairy slobbery sisters agree. We'll be meeting the rest of the cast next week...including the Policecat and the ringer in the jury pool! Please visit our friend Sparkle The Designer Cat on Sunday when she'll be featuring Jurors #4 & #8! Pee S - Glogirly and Flat Katie are off at Barkworld this week....cheating on me I'm sure. So please forgive me if I'm not able to swing by your blogs and say hi. Don't worry, I'll make her pay. I feel your pain Katie, I myself got abandoned last week. The nerve of your human...I mean, Barkworld? You don't even have a woofie. Nellie, I thought your answers were awesome! And of course, Katie did NOTHING WRONG! I'm keeping my paws crossed for you !!! Well I certainly would trust that one! Me hopes yous made good use out of the item I brought yous in jail. Me can't believe anyone would think yous was guilty! Are you alloed to even talk to jury members whilst the trial is ongoing? I guess I shouldn´t speak as me too is a jury-member ?? So I just say MIAOW !! Nellie had us worried for a while! Oh boy! I can't wait to see me! I move to have Juror #1 dismissed cos her slobbery sisters are dogs. Nellie, are you the wild card in the jury because all 12 must be in agreement for a verdict.